Making the Most of my Chance | Phil – Refuelled! This post is in response to the ‘100 Word Challenge’ here, where there are links to lots more responses. The brief was to write 106 words, including the phrase shown in bold. I had begun quite powerfully, but soon felt myself flagging. However, I had been promised this chance for some time, and knew that it would be a while before I could attempt this again if I was unsuccessful, so I was determined to keep going, despite the pounding in my head. The final part of the instruction was not an enjoinder to appeal to the Almighty – although that wouldn’t have been out of place – but rather, a reminder of the best hand position. It helped. And… here was the bar. I had swum a length! This is an actual account, from memory, of the first time I swam a length of a swimming pool, being watched by a teacher, so that I could have a certificate. It was, erm, lets just say, a long time ago! 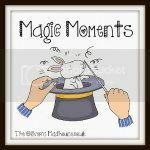 I have now linked up this post to ‘Magic Moments’ hosted at The Oliver’s Madhouse. Funny how it seemed really ‘real’ to read – then it turned out it was! The truth will out. Kept me guessing right to the end.